“Madonna? Really? They couldn’t get somebody more current?” I asked. This conversation between GAP and me went back and forth for a few minutes. He contended that today’s Top 40 artists just don’t have the star power or gravitas to headline a Super Bowl halftime show. He conceded that a few of my suggestions were valid – Lady Gaga, Beyonce, and Justin Timberlake (though lately you’re more likely to see Justin on a movie screen than hear him on your weekly countdown). But beyond those three, I agreed, it was hard to come up with someone who had a substantial enough reputation to carry the weight of the performance. But why is this? The music industry is still cranking out hits. We’re still buying their music. I still turn on the radio almost every time I get into the car. I wonder what’s wrong with today’s stars. And yet there’s something about, “And now your Super Bowl Halftime show starring TAYLOR SWIFT!!! !” that just doesn’t quite do it for me. The sweeping majority of these were nostalgia acts. But why? Not everyone who watches the Super Bowl is over 45. In fact, it’s probably got the most diverse demographic of viewers of anything on television. Young, old, rich, poor, male and female. There is very little filter. So why the trips down rock and roll’s memory lane? 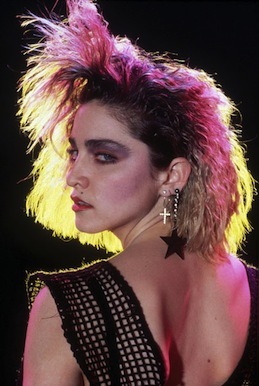 My theory is this: Madonna wasn’t always Madonna. Twenty-five years ago she was a punk girl from Michigan with bleached hair, lace gloves, and a dream of making it really big. It took a long time for her to become the legend that she is today. Twenty years from now Katy Perry may be an intergenerational pop music icon. But for now she’s a cute girl with a string of hits. We’ll have to wait and see what her staying power is like. It takes a bigger and more lasting career than most “of the moment” stars have to offer. The other reason I think most of these acts are a generation old? Remember what I said about the Super Bowl being the great demographic equalizer? The event planners have to cater to a huge range of people. If they put Katy Perry up there my mother would say, “Who’s the girl with the blue hair?” and head into the kitchen for some friendly chit-chat between halves. But even your average 12-year-old knows who Madonna is, and might stick around to watch. I think it would be a fascinating job choosing the Super Bowl halftime act. Who’s big enough and has broad enough appeal? Who is available and whom can we afford to pay? Which songs from their catalog will they play? And so on. Usually I just sit there and eat more guacamole while I watch. But last night I started thinking about the strategery behind it all and it got interesting. This entry was posted on Monday, February 6th, 2012 at 7:19 am	and is filed under Culture, Just For Fun. You can follow any responses to this entry through the RSS 2.0 feed. Both comments and pings are currently closed. Personally, I enjoyed my superbowl spinach dip and chips without watching the superbowl, though I imagine a halftime show that would have really enticed me could have encouraged turning on the TV.